E-Z Window Cleaning’s history starts back in 1999. 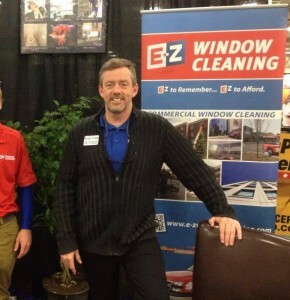 Founder, Michael Cornish, started E-Z Window Cleaning in April of 1999. Michael’s original idea was to earn a little “extra” money, on a part time basis. While growing up in southern California, one of Michael’s first jobs was window washing. Michael brought his experience along with his entrepreneurial spirit to Wisconsin, and he started E-Z Window Cleaning. In the spring of 2002 Jason York joined forces with Michael in the business. As the years have gone by, E-Z Window Cleaning has and will continue to add other key personnel to the family. Since 1999, E-Z Window Cleaning has grown into a year round, full service professional window cleaning business. Our client list includes your neighbors, award winning local builders, national hotel, restaurant, and retail chains. While E-Z Window Cleaning specializes in residential & commercial window cleaning, our services have expanded to include power washing, gutter cleaning and light fixture cleaning. Now that you know a little about us and our history, we hope you will contact us for an estimate.